Illustration of Venus Express aerobraking. A European spacecraft that's been orbiting Venus for the past eight years has finished a month-long maneuver that sent it rocketing through the outer reaches of the hellishly hot planet's atmosphere. The European Space Agency's Venus Express probe wrapped up this "aerobraking" move and entered a new, higher orbit in late July, ESA officials said. It will continue to study Venus for several more months, probably until December, and then, as its fuel runs out, dip back into the planet's thick atmosphere for good. During the aerobraking maneuver, Venus Express studied regions of Venus' atmosphere that had never been studied before, often getting as close as 81 to 84 miles (131 to 135 kilometers) above the planet's surface. 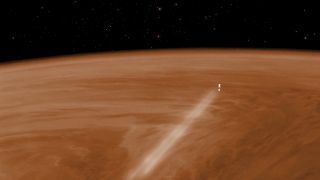 An artist's depiction of the European Space Agency's Venus Express spacecraft streaking through the Venusian atmosphere during its month-long aerobraking maneuver in 2014. "We have collected valuable data on the Venusian atmosphere in a region difficult to characterize by other means," Venus Express project scientist Håkan Svedhem said in an ESA statement. Specifically, Venus Express found that, between altitudes of 81 and 103 miles (130 to165 km), the atmospheric pressure increased by a factor of 1,000. Also, during several brief periods lasting 100 seconds each, temperatures increased by more than 212 degrees Fahrenheit (100 degrees Celsius), researchers said. The spacecraft's normal orbit during the bulk of the past eight years took it along an elliptical path that went around Venus every 24 hours. While above the planet's south pole, the probe peered down from an altitude of 41,000 miles (66,000 km). When the craft was above the north pole, it flew at a relatively close altitude of 155 miles (250 km), just at the top of the planet's atmosphere. The new orbit takes Venus Express out to a maximum distance of 39,150 miles (63,000 km), and in to a minimum altitude of 286 miles (460 km). The atmosphere-skimming maneuver also provided information on how to use aerobraking in future missions to alter a spacecraft's trajectory and orbit, researchers said. "Aerobraking can be used to reduce the speed of a spacecraft approaching a planet or moon with an atmosphere, allowing it to be captured into orbit, and to move from an elliptical orbit to a more circular one," ESA officials said. "Less fuel has to be carried, yielding benefits all-round."